Climbing out of my post-Christmas stupor (and read-a-thon), it’s time for the second installment of my annual reading highlights. You can read January-April highlights in the previous post. This post will cover May-August. Once again, all the highlights are from the m/m romance genre. 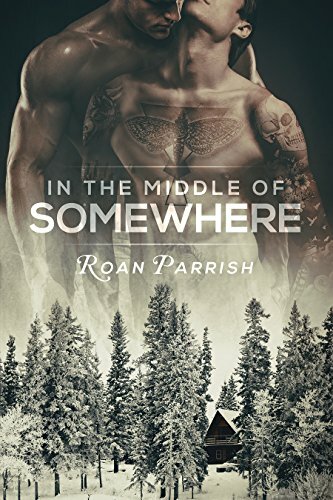 This month is noteworthy for the discovery of Roan Parrish, whose books In the middle of somewhere and then Out of nowhere are wonderful. The first is about Daniel, a guy who takes a college teaching position in a small Northern Michigan town, where he meets the reclusive Rex, a local furniture maker. In addition to being a gorgeous love story, it’s about Daniel’s struggles to connect with his auto-mechanic father and brothers (who live in Philadelphia), and reconcile their differences. Told first-person present-tense (which I love), this story is not high action drama, but instead deep and soulful and character-complex. It’s a beautiful book. Out of nowhere is about Daniel’s brother Colin, portrayed as excessively homophobic and vicious towards Daniel in the first book, but who is in fact dealing with his secret developing relationship with social worker, Raphael. (That was probably a bit of a spoiler for In the middle of somewhere, but it can’t be helped — sorry!) This book runs in parallel for much of In the middle of somewhere — and I loved seeing some of the same events from the opposing viewpoint. Set in Philadelphia, much of it around a youth LGBT centre, Out of nowhere a very different book from the first. Colin’s journey is more angst-ridden, and his transformation more profound than Daniel’s. This is also a fabulous book, but I think as a pair these two make more than the sum of their parts. 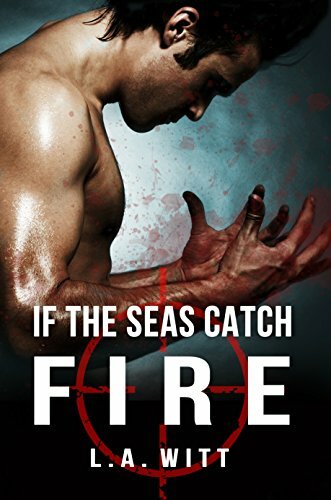 Another fabulous book for May was If the seas catch fire by L.A. Witt. (Yep, she’s definitely one of my favourite authors.) This one is high action and high angst, involving the forbidden romance between two hitmen. It’s set in an Italian Mafia-ruled American town in which Dom’s is one of the ‘ruling’ families. Meanwhile, Sergei is a lone wolf assassin with his own quest for vengeance. The two cross paths, fall in love, and although it’s not exactly a Romeo & Juliet scenario, there are plenty of conflicting agendas. Dom is actually a gentle and decent man trapped by circumstances, while Sergei is the victim of past wrongs in need of redemption. The road to these two finding a way to be together involves plenty of assassinations (some of them heartbreaking), plenty of danger (I was shaking in my boots), the highest of high stakes and OMG it is soooo good. But wait, there’s more! Another memorable read for the month of May included Saving Samuel by Nicole Colville. This is m/m/m about Daniel (a firefighter), Samuel (who Daniel rescues from a burning building), and Milo (a cop who’s in a casual relationship with Daniel… and who is also investigating the case of the burning building). Samuel has a mysterious and tormented past that sees him in need of protection, and who better than a hunky fireman and police officer, who find their difficult relationship just needed the addition of a third to make it work? 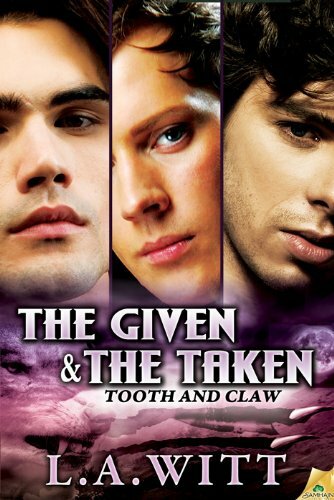 More L.A. Witt in June, this time a paranormal menage trilogy involving werewolves and vampires… The Tooth & Claw trilogy comprises The given and the taken, The healing and the dying, and The united and the divided. The premise of these books sounds so unlikely, and the covers are not so great, but despite all this I decided to trust in LAW and I ended up loving the whole series. It’s set in a alternative NW America (both USA and Canada), in which werewolves are accepted in human society and hold a fair amount of power, but vampires are hunted and reviled. These books involve road trips and car chases and plenty of werewolves with guns. There are also betrayals and hidden sanctuaries and a vampire turned into part werewolf and a werewolf turned into part vampire… and it’s just so crazy it’s awesome. Not to mention an interesting m/m/m relationship. My other favourite book in June was Strong Signal (Cyberlove – book 1) by Megan Erickson and Santino Hassell. This was about two gamers — one who is a reclusive gaming genius with a live feed on one of the gaming channels, and one who is deployed in the Middle East. They fall for each other online, but the second half of the book is what happens when they meet in person. It’s fabulous. In July I absolutely fell in love with Priddy’s Tale, a gorgeous new novella by Harper Fox. I loved this so much I immediately read it again and wrote a full review. It’s a fantastical tale about a lost young guy who lives in a Cornish lighthouse and falls in love with a charismatic merman. Set in the wild and exciting south-western tip of Cornwall, Priddy’s Tale filled with magical and impossible things, and infused with beautiful language and an abundance of ocean-themed imagery. I would recommend this book to anybody and everybody. Utterly beautiful and one of my highlights of the year. I discovered the English author Garrett Leigh in July. The first I read was Misfits, which I loved. It’s another m/m/m, this time involving a chef and his restaurateur lover/business partner, who have an open relationship that leads to the addition of a guy who turns out to be the missing link in their relationship and partnership. 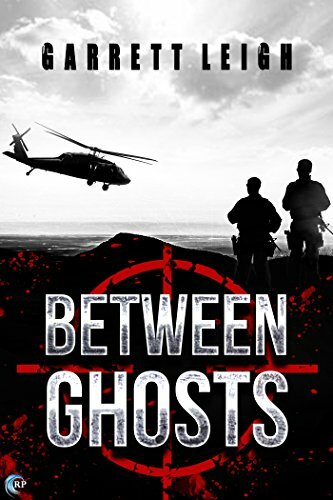 Even better, though, was Between Ghosts, which is set among a British SAS unit in Iraq during 2006. Connor is a journalist embedded with the SAS unit, who is seeking closure and answers related to his brother, killed in Mosul three years earlier. Nat is the commander of the unit, and their love story takes place amid the drama and blood and terror of war. I loved the vivid setting — it gives amazing insight into the conditions faced by the British troops. And there’s plenty of danger and intrigue as the SAS unit seek out certain sensitive information and attend to their duties. I loved this book so much. It was a quieter month of reading in August, but one of my favourite books for the month was yet another by L.A. Witt — Running with Scissors. This one is set around a popular rock band. I also enjoyed the first three books in Santino Hassell‘s Five Boroughs series — Sutphin Boulevard (which was a re-read), Sunset Park and First and First. So many great books — I just want to re-read them all right now! I’ll publish the final installment of 2016 reading highlights in the new year.